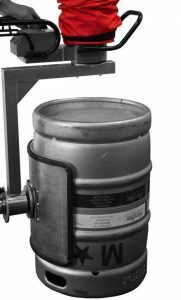 Vaculex VL solution with a custom built barrel tool has been developed for breweries with focus specifically on micro-breweries. The Vaculex VL lifting solution allows you to lift, rotate and stack the barrel in one motion. This process can forklift. Thus, the overall working process will become easier, smoother and faster. Our Vaculex vacuum-lifting solution is ergonomic, flexible and reduces the load on your body by more than 80%. Thus minimizing strain injuries, back pain and sick leave while increasing efficiency and user happiness.